The iPad mini 2, officially known as the iPad mini with Retina display, was recently released to a waiting public. This tablet will be making its way onto many people’s holiday wish lists and a case is a good idea for keeping it looking good and protected. Today we have budget and luxury iPad mini 2 case picks for both ends of the market. Some people just want a practical inexpensive case for their devices while others want a touch of something special and these two choices cater for both. A case is also a great gift idea for someone you know who is getting the iPad mini 2 or already has one. 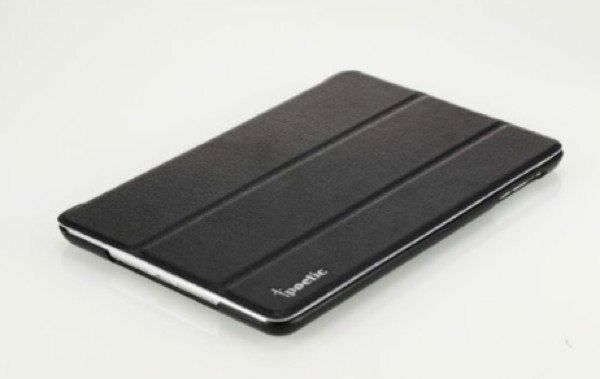 Our cheap and cheerful choice is the Poetic Slimline Case for iPad mini 2 with Retina display. This case is just $9.95 but has good customer ratings on Amazon. It comes in a variety of color options and the above link is for the black version with other color choices shown underneath. This case is a sturdy folder design that will protect the back of the iPad mini 2 as well as the screen. The Poetic Slimline case is shock-resistant and made from high-quality flexible PU with a microfiber interior lining that will protect your tablet from dust and scratches. It has a magnetic cover that offers a sleep/wake function when you open or close it and the trifold cover can be rolled back for multiple viewing positions. This case also offers access to the charging port, speakers and buttons. Now we’ll go to the other extreme with the Michael Kors Clutch for iPad mini, which is available from the Apple Store. This is compatible for the original iPad mini as well as the iPad mini 2 with Retina display and comes in black. The price tag is $129.95 and although this might sound steep this is an individually crafted premium Saffiano leather book-style case. The case features a rigid protective layer for durability and the interior has multiple card pockets for convenience. The Michael Kors Clutch case snaps closed to keep your iPad mini secure and all around this case offers craftsmanship with attention to detail. There’s also a full-sized iPad version priced at $149.95. Either of these case choices will offer good protection for your iPad mini 2 and help to keep it looking as good as the day you unwrapped it. You might also like to check out our recent best iPad mini 2 case selections from Griffin or iPad mini 2 cases with keyboards. If you decide to purchase either of these iPad mini 2 cases we’d really like to hear what you think of it, so do let us have your comments.